Werewolf stories aren’t for everyone, but those of us who love the subgenre will generally take whatever we can get. The great pieces tend to win lifelong place in our hearts while the mediocre affairs are generally entertaining, even if they aren’t spectacular. 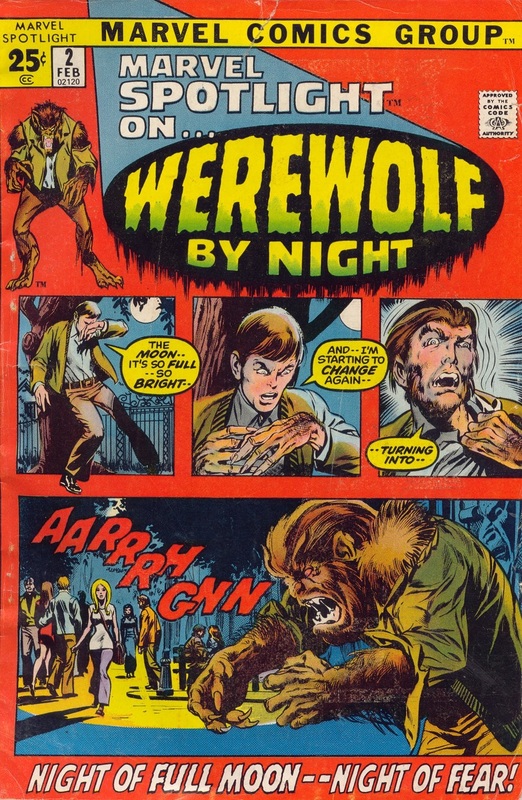 It’s rare to see a downright flop within the sub-genre, and thankfully, Marvel’s early-70s trek into lycanthropic territory, Werewolf by Night, which originally debuted as something of a test run in a few Marvel Spotlight books, isn’t without faults, but it is an extremely endearing story with some memorable characters and some heinous villains. In Marvel Spotlight on… Werewolf by Night #2 we’re introduced to Jack Russell, son to a scholar and warlock who transformed into a werewolf for three consecutive nights as the full moon rose. Jack, like his father, is afflicted by the same strange condition, which he learns without question, on his 18th birthday, when he first makes the change. From there, life takes a strange turn and things become complicated for the young Russell, who sees his mother murdered, his step-father responsible and a hired hitman with blood on his hands. What will Jack do? Will he kill the men who killed his mother? Will he continue to live in the house of what he suspects is one of two men responsible for the death of his mother? What will become of his sister, Lissa? The questions are birthed at a rapid rate, and slowly but surely writer Gerry Conway provides the answers. Conway’s writing is a little uneven, and there are a few grammatical hiccups to swallow down, but Werewolf by Night still has a lot of charm to respect. Conway’s heart is in the right place, even if he’s not the most technically refined of writers. Michael Ploog provides some solid illustrations, and gives readers a werewolf that looks like he could have been created in Jack Pierce’s chair. I love that, the look of the beast, and I think it’s a quality that hasn’t really been recaptured since this original story. Marvel Spotlight on… Werewolf by Night #2 is a blast of a read. It’s successful in launching more than a good character with some terrible problems, it’s also successful in helping to fill the genre void that Marvel has always dealt with. At a time when horror was still relatively tame, this story offers a reasonably edgy narrative and some sinister decision making. It could be a more brutal read, and the story could be tightened up, just a tad, but it’s hard to deny how fun the book really is. This one can be tracked down in digital format (well, I was gifted a digital collection of the full run as an early Christmas gift, so I’m assuming it isn’t too difficult to get your hands on), and I’d strongly recommend seeking it out!